In the centre of the space, a freestanding kitchen composition skilfully combines cabinets featuring the T45 Evo concept and a kitchen hub boasting the T30 concept. The cabinet unit is equipped with retractable doors, which hide away by the means of a simple touch, revealing the technical and storage equipment: low cabinets and hanging units with drawers and doors, a refrigerator, the dish washer and a combined oven. The worktop of this segment is equipped with an induction plate and hob and offers plenty of space for the entire cooking process. The lower cabinets apply the T45 Evo concept, which almost make the worktop disappear thanks to a precise 45 degree cut of the top. The island features the T30 concept, with the doors opening by the means of a simple 30° degree cut at the upper end. The Air worktop includes washbasins in stainless steel and space for the preparation process. The lower cabinets host a freezer and storage space inside drawers and crates. 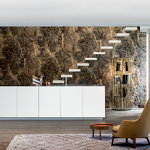 All structures are made with natural birch wood, combined with Grigio Monviso laminate and laquered edges. The retractable doors feature a fossil laminate, elegantly combining with the light grey colour of the hub. The kitchen appliances are made by Miele, oven by Gaggenau, hob by Falmec.